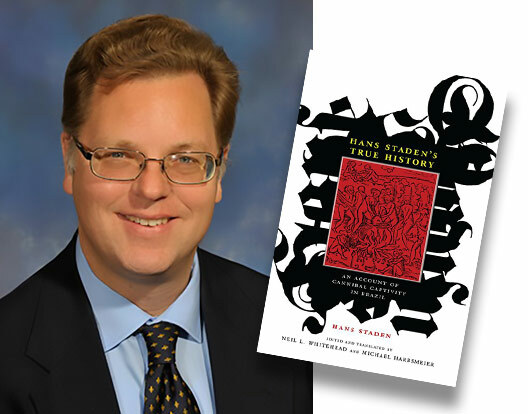 Dr. Vejas Liulevicius specializes in modern German history, with a particular focus on German relations with Eastern Europe. He completed his Ph.D. at the University of Pennsylvania in 1994 and was a postdoctoral research fellow at the Hoover Institution on War, Peace, and Revolution from 1994-95. He has taught at the University of Tennessee since 1995. Since 2008, he has served as the director of the Center for the Study of War and Society. Dr. Liulevicius will be speaking about Hans Staden, a German in the New World in the 1540s and 1550s, in Portuguese service, encountering new lands and peoples. Taken captive by Brazilian tribes, Staden experienced life among them. On escaping captivity, he returned to Europe and wrote a blockbuster account of his life among people he described as cannibals. This shocking book, reprinted through scores of editions, had a vast influence on European understandings of the Americas and exploration in general.